Chalo Dildaar chalo...Chand Ke Paar Chalo !!! My heartiest congratulations to the team behind successful launching of India's first unmanned moon spacecraft Chandrayaan-1. 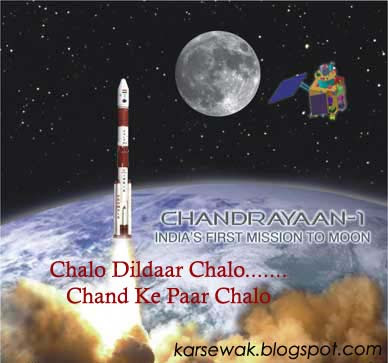 Its really great moment for Indians that they have successfully launched a spacecraft to moon. Now we all Indians are desperately waiting for another moment when Indian tricolor will be flagged by an Indian astronaut on the surface of moon , With the success of Chandrayaan Iam sure this will happen in the near future . Glad to hear this cheerful news in the midst of other depressing news like Arundati ,Amar Singh demanding enquiry over Delhi Jamia encounter and Raj Thakerays anti-North rhetoric. And our media is totally pre-occupied with Raj Thakerays theatrical antics . What the media need is all the Sound bytes and ever increasing TRP’s, rather than reporting some positive News. While sharing Chandrayaan success with one of my friend , he told me of reports that Pakistan too is thinking about sending an un-manned Space Craft on to Moon. No Surprises , Pakistan always copies us . In a way, we have good follower in our neighbourhood. The same friend raked up an issue saying that all the scientists at ISRO are from ordinary Engineering colleges none are from Premier IITs and further took the argument saying these IITians prefer NASA rather than ISRO. And all the subsidy’s we give to IIT’s shud be withdrawn as it is wasting the money on these Brain Drainers. I don’t agree with his argument, Indians always believed in our ancient mantra of “ Vasudaika Kutumbakam” , whole world is my family. Indians always believed in sharing the knowledge for Human Development. Thus ,I feels it makes no difference if IITians are working for ISRO or NASA as long as they work for Human Development. Having said that , I wud be the happiest, if our IITians stay/come back and help Indian Technology to thrive. Here one shud remember that Chandrayaan project was cleared during Atal Bihari Vajpayee regime . Talking of politicians, may be Amar Singh ,Mulayam, Arundati Roy may feel that India has offended Crores of Muslim religious sentiment by taking an Spacecraft on to their (muslims) ‘Holy Chand’ , may also further threaten to withdraw support to UPA govt, if an enquiry commission on Chanrayan is not constituted. How about sending these Amarsinghs,Mulayams, Arundatis on to moon with one way ticket and No Comebacks !!! Great Raj. I totally endorse your views on this. The Moon is sacred for us Hindus also. But Chandra Bhagawan will welcome our rocket and entertain it. We excell in hospitality, don't we ?